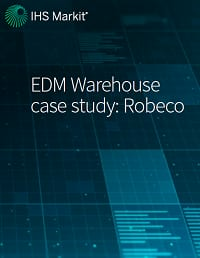 A longstanding user of the Enterprise Data Management (EDM) platform from IHS Markit, Robeco concluded that it also needed a data warehouse to address requirements to analyze and report on historical data in a timely manner. The firm chose EDM Warehouse to meet these demands. To receive this free case study from IHS Markit, please complete the form below.